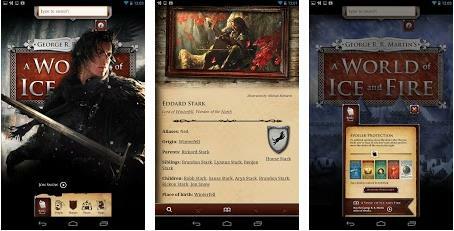 An Official App for the most popular popular TV show "A Game of Thrones" is released for android now available for download on the Google Play Store. Don't get confused by the name "A World of Ice and Fire" it's the original book by George R. R. Martin which later renamed and launched as Game of Thrones on HBO. The app is an official guide to the show that lets you keep track of your favorite characters,With more than 540+ characters and 380+ places it would be a difficult task to remember all that names and with this app on your Android phone or tablet it will be a lot easier to recollect the name and places using the app.